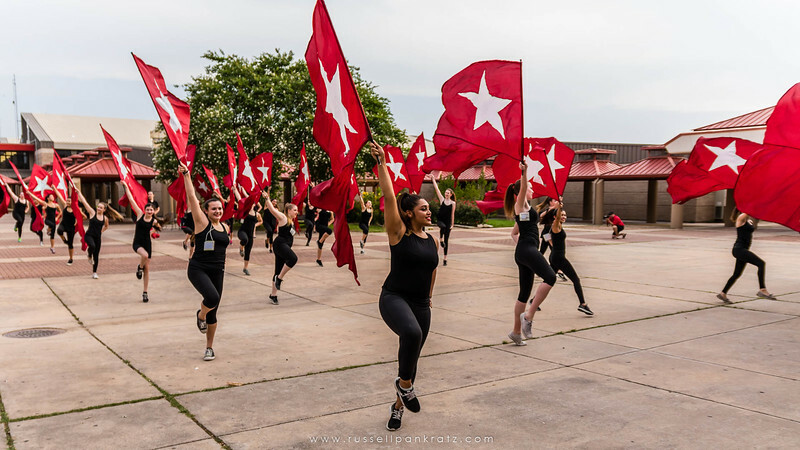 The OPE, including prospective new members from surrounding middle schools, have spent the last week learning music and flag spinning for the fall program. Friday night they performed pieces of it for fans, families, and friends before the Spring Dinner and Auction. I have photographed my son, Jordan, a graduating senior baritone Section Leader, for the last 4 years in an effort to document his time with the greatest organization he has ever been a part of. My time with the JBHSOPE is coming to an end in a few more days. I saw an awful lot of cameras around the OPE, so I feel your families will not be lacking photographic documentation in the coming year. Be appreciative to those folks, and you'll be rewarded with many fine images of your OPE members. I don't mind if you share any photos you find of your OPE member on social media sites and emails as long as you leave my watermark along the bottom of each image. These images are optimized for viewing on-screen on your electronic devices -- they won't reproduce well in printed form because these JPG files are highly compressed and are of reduced resolution. If you would like prints, please contact me via email and I can handle any printing needs you have. Identify images by their captions. The caption includes the date/event/file number of each image. With that data I can identify your image among the thousands I'll shoot this year. Then tell me what size print you would like and if you need multiple prints of any image. I have decided to only print the Bowie OPE images on metallic paper from this point on. I produce contrasty, saturated color images, and high gloss, metallic paper reproduces that type image like nothing else. The problem is it costs twice as much, but it is worth the cost. There's a lost of driving involved as well, so I'm making amendations to pricing. I don't profit from providing you prints of the OPE, I'm just trying to recover costs. I hand deliver your print orders to your home or by other arrangement. For you technical types: I shoot with a Canon EOS 7D Mark II body; with a Sigma DC 17-70mm f/2.8-4 Contemporary lens (my APS-C size sensor effectively changes my lens's focal length to 27-112mm). I shoot all my images in RAW format, so I have to spend hours processing everything I shoot into JPG images. I edit these images on a calibrated and profiled monitor. Your screen is not calibrated, so the colors, contrast, and exposure of my images won't look the same on your screens. If you were to print my image, you would see the image the way I edited it because all printers are calibrated to the same standard as my monitor. It takes me a few days to post my images after an event.